What’s to become of the boy? What’s to Become of the Boy? is a spirited, insightful, and wonderfully sympathetic memoir about life during wartime written with characteristic brilliance by one of the 20th-century’s most celebrated authors. It is both an essential autobiography of the Nobel Prize-winning author and a compelling memoir of being young and idealistic during an age of hardship and war. HEINRICH BÖLLwas born in Cologne in 1917. 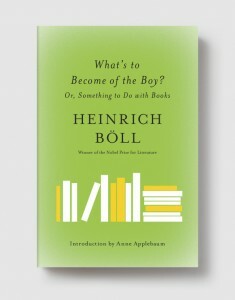 Despite his background as a Catholic pacifist, Böll was conscripted and saw combat during the second World War. He was wounded four times before surrendering to American Soldiers. He published his first novel, The Train Was on Time, in 1949. His best-known novels include The Clown, Billiards at Half-Past Nine, and Group Portrait with Lady. Böll served as president of PEN and was awarded the Nobel Prize for literature in 1972.